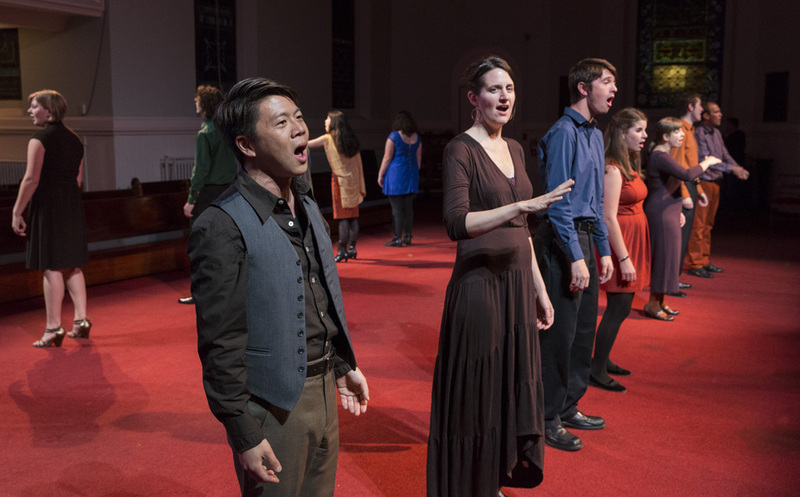 The women of the M6 have been invited by Performa, the three-week biennial dedicated to exploring new visual art performance across disciplines, to perform Meredith Monk’s Tablet on Weekend One. 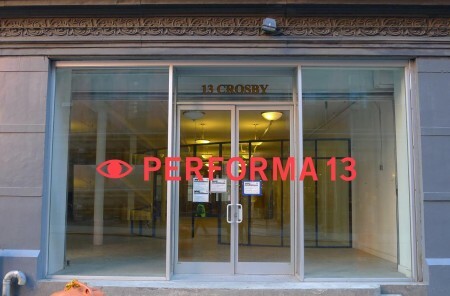 More than 100 events are presented at over 40 venues throughout New York, breaking down the boundaries between visual art, music, dance, poetry, fashion, architecture, graphic design, and the culinary arts. Opportunities to hear this astonishing piece for three women playing piano and recorders are rare — if you’re in New York, make time to go! A concert exploring the female vocal, borrowing from Joan La Barbara’s 1976 statement that “voice is the original instrument”, an idea which retains greater resonance today, now that the human voice is increasingly subjected to forms of modification, manipulation, distribution and dispersion. Though it might be the ur-form of communication, the voice is an unknowable material with a fleeting presence, which has once again become a focus for artists and curators. 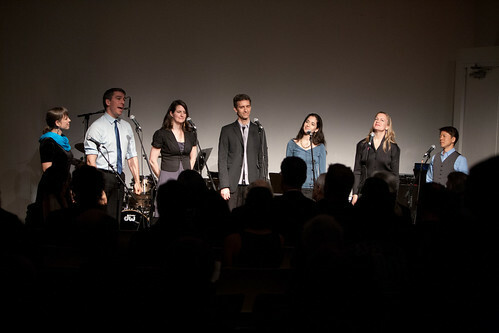 This concert presents the work of three vocalists who pioneered, developed and continue to push the potential of the voice and the musical genre known as Extended Vocal Technique, from Joan La Barbara’s early and seminal LP Voice Is The Original Instrument (1976); Meredith Monk’s primary and innovative vocal archeology in Tablet (1974/1976) performed by the women of The M6 to the sculptured and digitally manipulated vocal sounds of Norway’s Maja Ratkje. 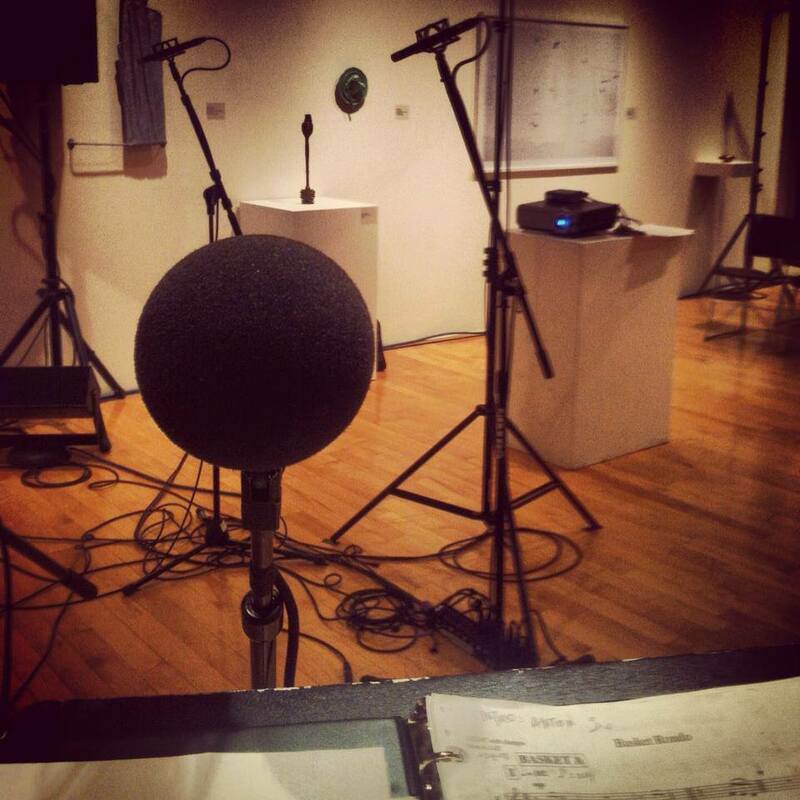 Voice is the Original Instrument is a Performa Project curated by Mark Beasley. We’ve been working with the impeccable Tom Bogdan and a group of students from Syracuse University and SU Arts Engage all week to mount a new production of Meredith Monk’s “A Celebration Service” this weekend at Plymouth Church in Syracuse, New York: Saturday at 7pm and Sunday at 10am! Conceived and composed by Meredith Monk and directed by Tom Bogdan, A Celebration Service is performed by The M6: Sasha Bogdanowitsch, Sidney Chen, Emily Eagen, Holly Nadal, Toby Newman, Peter Sciscioli and joined by Carole Brzozowski, Jay Getman, Sean Jordan, Stephen Mitchell, Brian Savage, Kamala Sloss, Sasha Turner and Maria Whitcomb from Syracuse University. The readers are Stephen Cross and Kara Greene with organist Joseph Downing and second keyboardist Stephen Mitchell. Coordinated and supervised by Michele Koziara and taught by Allison Easter from Meredith Monk & Vocal Ensemble, the dancers are Lydia Dwyer, Maya Dwyer, Tevin Johnson, Lydia Kelly, Julia Lendy, Rachael Lieblein-Jurbala, Sarah Linquest, Alexandra Purdy and Arthur Sicilia from Manlius Pebble Hill School, and Sofi Elbadawi from Fayetteville-Manlius High School. 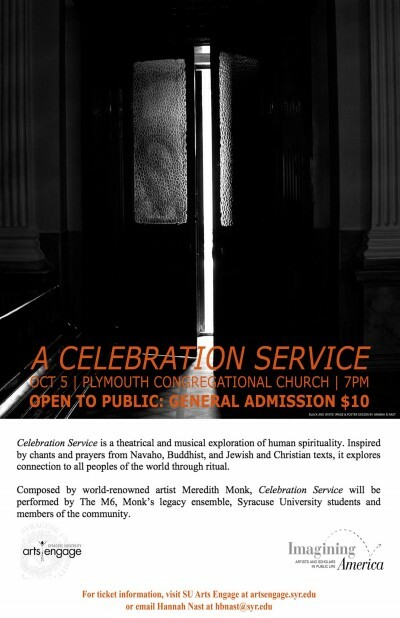 Choreography for the “Celebration Dance” is by Meredith Monk in collaboration with the original cast. Production Coordinator for The House Foundation for the Arts and the Rehearsal Assistant is Peter Sciscioli. The Project Manager is Leo Crandall for Syracuse University Arts Engage, assisted by Hannah B Nast. Lighting Design is by Scott Holdredge and the Crew Chief is Jeffrey York. 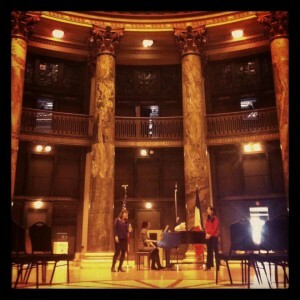 The M6’s Emily Eagen and Theo Bleckmann have been invited to perform music by Meredith Monk at TEDxMet, the first-ever TEDx event to be held in an art museum. The all-day event will be streamed live from the Grace Rainey Rogers Auditorium at the Metropolitan Museum of Art in New York on Saturday, October 19. 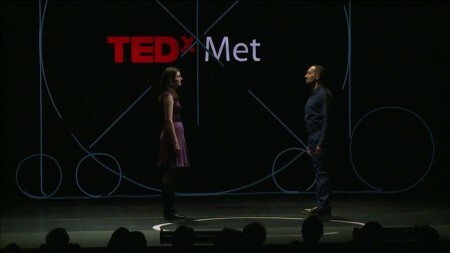 The programming of TEDxMet was organized by Limor Tomer, the Metropolitan Museum’s General Manager of Concerts and Lectures. Click here for the full list of participants. Come join us on Friday night for the opening night of the Look and Listen Festival, an annual event dedicated to presenting new music in art galleries! 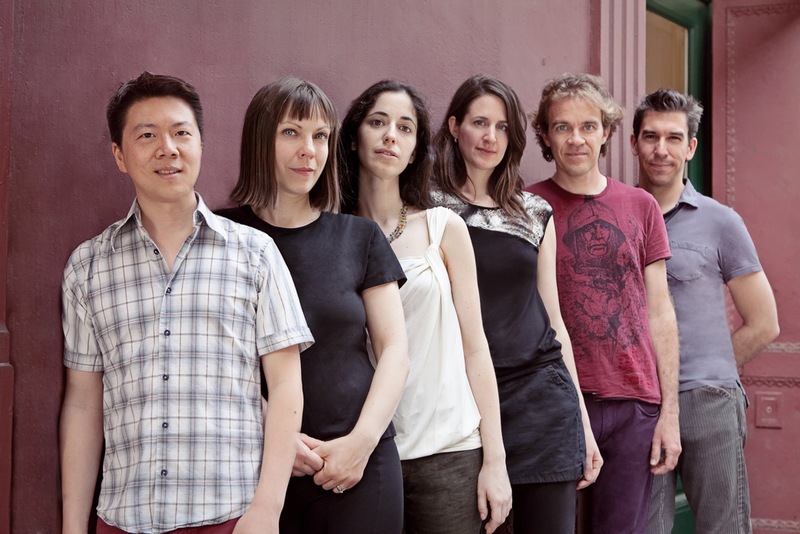 We’ll be performing Meredith Monk’s exhilarating and rarely-heard “Basket Rondo” for six voices. Hosted by Terrance McKnight, the opening concert of the 2013 festival features the world premiere of Self-Portrait* (2013) for cello, piano and film created and performed by composer/pianist Michael Brown and filmmaker/cellist Nicholas Canellakis. The Canellakis-Brown Duo also plays Lutoslawski’s Grave (1981) and Bulgarian Folk Tunes Gankino Horo & Daichovo Horo, arranged by Nicholas Canellakis. The Jack Quartet gives the New York Premiere of Lewis Nielsen’s Le Journal du Corps (2010), The M6 performs Meredith Monk’s Basket Rondo (2007) and Michael Brown offers George Perle’s Short Sonata for solo piano (1964). 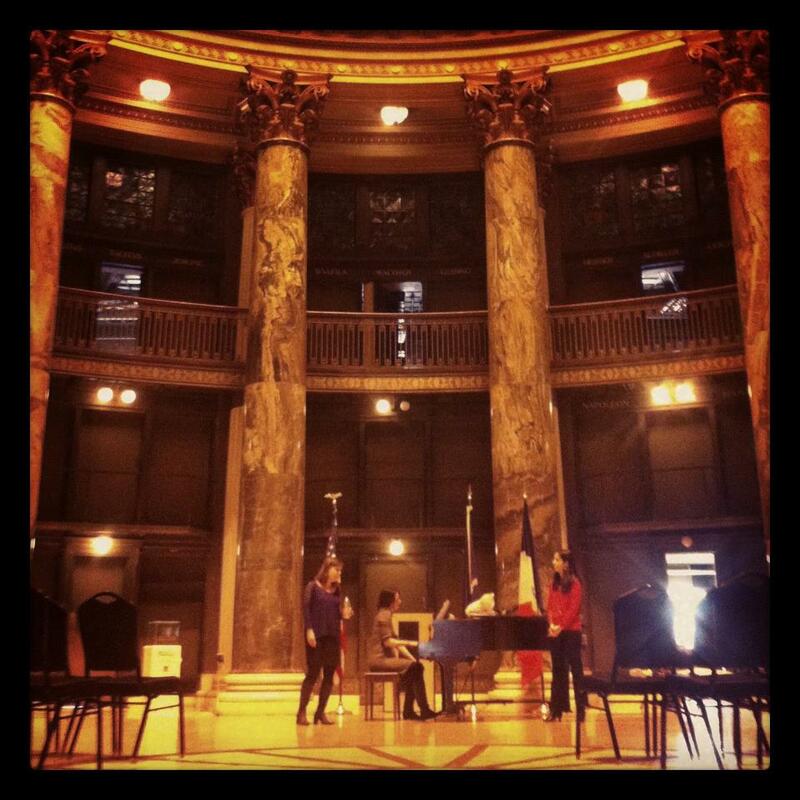 Sound checking for our concert today in the rotunda at the beautiful Gould Memorial Library on the campus of Bronx Community College – thanks, CUNY, for hosting us! After a brief hiatus while we were all working on different projects — performing in India and Serbia, developing a festival of vocal music, starting a family, that sort of thing – The M6 is back! 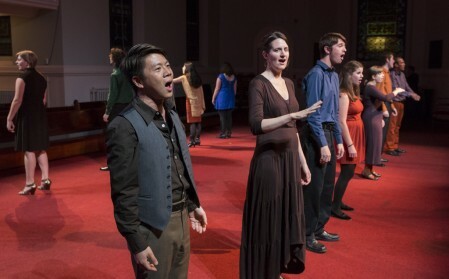 Four members of the group will be performing a selection of solos and duets, plus “Three Heavens and Hells” for 4 treble voices, at a noontime concert on Monday in the Rotunda at Bronx Community College. Details below! R755 theme designed by varometro. 58 queries in 1.354 seconds.